Each nation has many facets, many ways of being perceived. A key facet is its product, its unique way of life that provides utility for its people. Nations thrive and survive according to how well they manage the inevitable life cycles of their ‘products’. Nation: n. A stable, historically developed community of people united under a single government with a territory, economic life, distinctive culture, values and language in common. Raison d’être: n. Reason for being; justification for existence (always including collective security). Many conditions or factors working together cause a nation (or state) to come into being, rise, decline and ultimately expire. Only rarely, if ever, has a single factor been identified as causative of any stage in a nation’s life cycle, let alone for the entire cycle. However, we do identify stages in the life cycles of nations of the past, including markers that indicate those stages. Markers that indicate the life-cycle status of present nations may also be discerned. The birth of most nations was preceded by visions of something better, and an audacious gestation period. Once successfully born, all nations go through or have gone through a growth in prominence, maturity, decline and, for most so far, extinction. At the present time there are fewer than 200 nations in the world. These represent a tiny fraction of all nations that have ever been1; most have completed their life cycles and no longer exist. Geopolitical history presents a cyclorama of nations proceeding through life cycles. But these cycles have not generally been examined in terms of the pattern and process of innovation, perhaps because of the long time periods involved; the duration of most nations’ life cycles exceeds the attention span of any generation’s people, and most people do not seriously concern themselves with the circumstances of generations following their own life span. 1Nobody knows how many states or nations have existed in the history of the world, but the number is in the thousands. Since 1500 CE around 700 distinct nations / states have existed, including those that exist today. Its management is the bureaucracy appointed and hired by the head of state to conduct the nation’s business. A nation begins with an idea or ideal and attendant values held by an individual or relatively small group of people. As long as that idea/ideal is accepted by a critical mass of people within the nation, and attendant values are faithfully delivered by its government and agreed to by its people, and the nation is managed well, and timely and effective provisions are made for its future viability, the nation grows and endures. When any of these conditions is no longer satisfied, the nation declines and, eventually, is replaced by some other nation. Historical examinations of nations that no longer exist reveal stages of beginning, growth, maturity, decline and extinction. Similar examinations of existing nations can reveal clear beginnings and approximations of where they are in their life cycles. Most important, examination of present nations can lead to thoughtful consideration of where they are in their life cycles, why they are there, and what, if anything, can be done to extend their lives and prevent or delay the seeming inevitability of extinction. Figure 1. Life-cycle concept relevant to products, companies and nations. Note that new growth can be realized through innovation – new ways of providing the utilities or way of life central to the entity’s raison d’être. A nation’s beginning can be marked by a single defining event or document that sets out or affirms its raison d’être. Such usually follows a short or long period during which related values, ideals, visions and goals were articulated and contentiously pursued. A nation’s growth period is marked by expansion of its prominence and improvements in the lives of its citizens. Such may include increasing population, territory, wealth/income, education, freedom, power, hegemony … whatever attributes that enhance the way of life central to the nation’s founding principles. A nation’s maturity is marked by a peaking of its prominence. 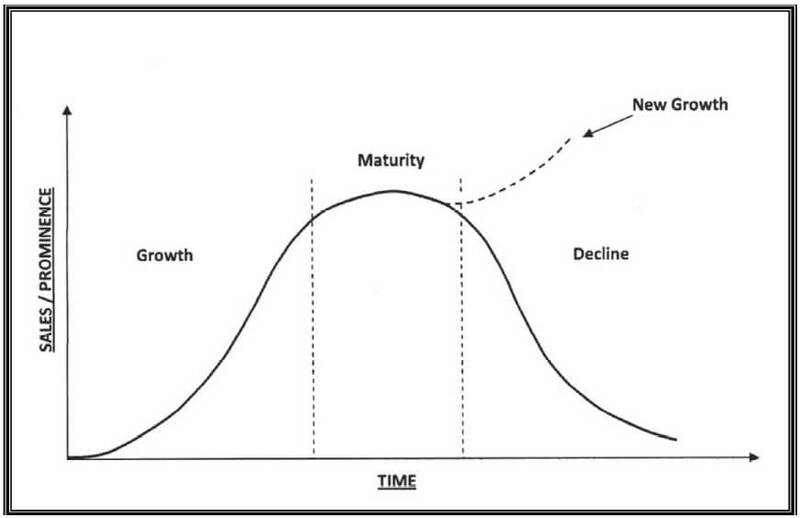 It includes a preceding period of slowing growth and a following period during which decline sets in. Theoretically, at least, a new growth period can be initiated during this phase. A nation’s declining years are marked by shrinking of its prominence – decreasing population, territory, wealth/income, education, freedom, power – manifestations of the way of life inherent in the nation’s founding principles. Decline is often accompanied/caused by persistent incompetence, complacency and corruption among the nation’s leaders. A nation’s extinction is marked by the end of its independence – absorption into another nation, breaking into parts, generic change in government, entropy/anarchy, diaspora, etc. Nations have fallen for many reasons – conquest, persistent and extreme incompetence or corruption, financial insolvency, catastrophic natural disaster or disease, to cite a few – but acceptance of its raison d’être by a critical mass of its populace is always essential for a nation’s survival. Analysis of a nation’s life cycle must begin with a clear articulation of its raison d’être and the utilities or way of life promised for its people. Attributes of that way of life must be identified and viewed longitudinally over the life of the nation. Different attributes may appear over time to accompany a constant utility or way of life. Relevant conclusions include how particular changes might have prolonged the life cycle of an extinct nation, or how suggested changes might extend the life cycle of an existing nation. Many nations have gone through complete life cycles. Historians have written extensively about the more notable of these, enabling identification of raisons d’être, related ‘signature’ ways of life and events or deviations that mark changes in growth cycles. Six nations based on democratic or republican ideas demonstrate applicable life-cycle principles and suggest what might be done to extend the life of the United States of America. Caution: Examine each case with absolute dispassion. Resist the urge to make moral judgments, however justified. Applying moral values will tend to cloud lessons to be learned. The United States of America is a federal republic. Around 325 million people live in 50 states, the District of Columbia (DC), and 5 major territories. Nine minor territories have no permanent population. These lands cover 3.8 million square miles. The U.S.A. came into being in 1776, reached maturity around 1945 and has been in decline since around 1993. Christopher Columbus discovered North America in 1492. The first permanent European settlers were Spanish explorers who arrived at San Augustin (Florida) in 1565. The first English settlers founded Jamestown (Virginia) in 1607. In 1620, colonists on the Mayflower arrived at Plymouth in Cape Cod Bay. By 1732 the 13 British colonies that would become the United States of America had been established. The role of the colonies was to produce raw materials for England and consume manufactured goods imported from there. They became increasingly vocal in their objections to that role with its increasing taxes and manufacturing restrictions. Tensions grew. Great Britain responded with increasing arrogance and repressive measures. In 1773, colonists reacted to one of these, the Tea Act, by boarding English ships and dumping more than a thousand chests of tea into Boston Harbor and the Delaware River. Great Britain’s response was more repression. In 1774, the First Continental Congress met in Philadelphia. It agreed to boycott British goods and cease exports to Great Britain unless the ‘Intolerable Acts’ were repealed. They weren’t. Violent skirmishes at Lexington and Concord began the American war for independence. In 1775, the Second Continental Congress created the Continental Army, with George Washington as Commander-in-chief. It then affirmed American loyalty to Great Britain and entreated the King to prevent further conflict. A ‘Declaration of Causes’ promised to lay down arms “when Hostilities shall cease …” but before it was received in England, Great Britain issued a ‘Proclamation of Rebellion’ declaring American rebels to be traitors. These principles, together with the Bill of Rights ratified in 1791, comprise the raison d’être of the United States of America. After more than 50 land and sea battles, Great Britain acknowledged American Independence. The Treaty of Paris formally ended the American Revolutionary War on September 3, 1783. It then sets forth a system of ‘checks and balances’ intended to ensure effective functioning without abridging individual rights. The new Constitution took effect in 1789. The first 10 amendments guaranteeing individual and states’ rights (Bill of Rights) were ratified) in 1791. George Washington was America’s first President under the new Constitution. He could have been king. But Washington was committed to the Republic; he absolutely refused to stand for a third term, thereby setting a precedent that lasted until 1940. Territorial expansion begun with the Louisiana Purchase in 1803 continued until 1916, by which time land area had more than quadrupled. Helped by waves of immigrants, population surged by 56 times that of 1776, to about 140 million by 1945.
fought. These included scores of limited engagements, mostly with Indian tribes in North America. And they included major campaigns – the War of 1812, the Mexican-American War, the Civil War, the Spanish-American War and, in the 20th century, World Wars I and II. The Civil War was the bloodiest conflict ever fought by Americans. It preserved the Union, and it enabled the end of slavery. The United States made an early commitment to education and regularly reinforced that commitment with land grants and federal support. By 1840, 55 per cent of children attended school. By 1870, all states had free elementary schools and, by 1918 all children were required to complete elementary school. In 1945, the median number of school years completed by all U.S. adults was 8.8. By the mid-1970s almost 90 percent of adults had completed high school. America’s history includes a continuing chronicle of individuals’ freedoms – expanding availability but also encroachments, erosions and direct attack by governments, citizens and institutions. At its founding, not all people in the United States had equal political status, nor were all given liberty to pursue happiness. The most egregious of such shortcomings involved slavery, American Indians and women. Slavery was a fact in all 13 original colonies / states. Enough of them deemed it sacrosanct / essential to prevent its proscription in the Declaration of Independence and Constitution. Nevertheless, after the Constitution was ratified, efforts began to curtail or eliminate slavery. The Slave Trade Act of 1794 prohibited the building or outfitting of ships in the United States for use in the slave trade and, in 1807, Congress outlawed the importation of slaves. Abolitionist sentiment and activity increased in the North, while Southern states fought in Congress and the courts to preserve slavery. A pattern of compromise and balance began as new states were admitted to the Union. But positions hardened. In its 1857 Dred Scott decision, the Supreme Court held that most Negroes could not be American citizens, and that the federal government had no power to regulate slavery. The Civil War began in 1860. In 1861, President Abraham Lincoln suspended the right of habeas corpus guaranteed by the sixth Amendment. The Supreme Court ruled that he did not have that authority, but Lincoln ignored it. In 1863, Lincoln issued the Emancipation Proclamation, an Executive Order that declared freedom for slaves in areas still in rebellion.